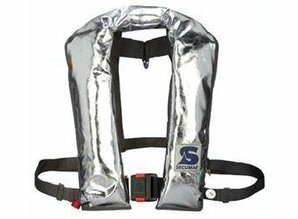 275N special inflatable work protection lifejacket for use with breathing equipment, e.g. fire brigade. 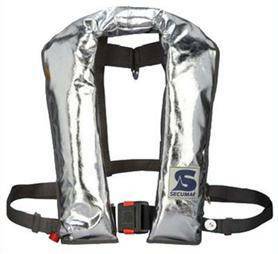 Special shaped bright orange buoyancy chamber suitable for use with helmets and breathing apparatus. With a D-ring at the back neck for extra personal security. The Golf 275 HV is also available with a highly heat-resistant Alu protective cover.